Two brothers meet in the remote Australian outback when the third brother is found dead, in this stunning new standalone audiobook from New York Times bestseller Jane Harper. Two brothers meet at the remote fence line separating their cattle ranches in the lonely outback. In an i... read full description below. Two brothers meet in the remote Australian outback when the third brother is found dead, in this stunning new standalone audiobook from New York Times bestseller Jane Harper. Two brothers meet at the remote fence line separating their cattle ranches in the lonely outback. In an isolated belt of Western Australia, they are each other's nearest neighbor, their homes four hours' drive apart. The third brother lies dead at their feet. Something caused Cam, the middle child who had been in charge of the family homestead, to die alone in the middle of nowhere. So the eldest brother returns with his younger sibling to the family property and those left behind. But the fragile balance of the ranch is threatened. Amidst the grief, suspicion starts to take hold, and the eldest brother begins to wonder if more than one among them is at risk of crumbling as the weight of isolation bears down on them all. 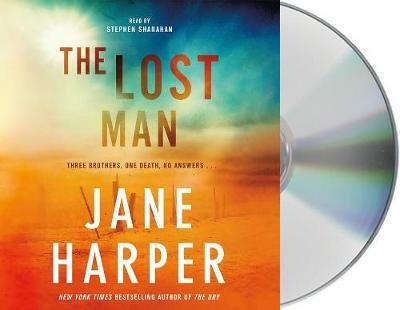 Dark, suspenseful, and deeply atmospheric, The Lost Man is the highly anticipated next audiobook from the bestselling and award-winning Jane Harper, author of The Dry and Force of Nature. Jane Harper worked as a print journalist for 13 years before writing The Dry, a #1 international bestseller, and Force of Nature, also an international bestseller. The Lost Man is her third novel. Originally from the UK, Jane lives in Melbourne.